Touch Of Belle : 2014 Blogger Challenge! 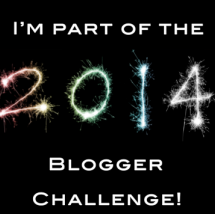 I wanted to write this post about the 2014 Blogger Challenge that I will be participating in . The Lovely Gaby from http://anothergirlyblg.blogspot.co.uk has created this challenge, The challenge is so simple and anyone can participate in it. If you are interested in participating ....its simple... just go to Gaby's blog and leave her a comment on 2014 Blogger challenge post with your URL and email address . The challenge is to write a post twice a month about different topics. Gaby will email a topic twice a month and the bloggers who are participating will write the post about that topic. I think this is such a wonderful idea to meet new bloggers and post something different. I am super excited to be part of this challenge and I cant wait to read everyone's posts!